The SwissRidge Family is vast and stretches across North America, with a sprinkling around the world. Thanks to social media, we can all mingle at our common meeting place, the Facebook Group. When I started out, I never envisioned such an amazing forum for keeping in touch with owners and watching my pups as they grow. I monitor constantly to see what issues are surfacing and join discussions if I have something to add. There are so many well-informed members, that people often beat me to the punch—or teach me a thing or two. I appreciate the contributions of every member of this fantastic family. Here at home, there are some key players I’d like to introduce, because they are often involved in one way or another with you and/or your puppy. I have to start with my mom, right? Without her, where would I be? Well, I’d be without some great dogs, that’s for sure. The day my mom decided to jump into breeding the Bernese with both feet was a great one for me. Although I started in this business first, it turns out I may have inherited the instincts and the eye for this work from her—not to mention the work ethic and determination. It must be part of our pedigree! 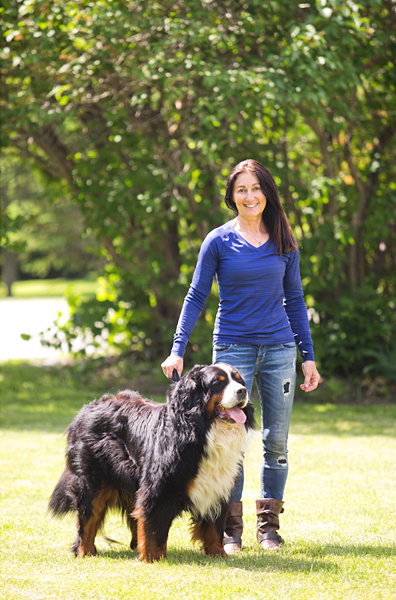 I admire her commitment to breeding healthier and (in my opinion) more beautiful Bernese. Please visit Moorsbernese.com and check out her dogs. To be honest, you may find the cream of the crop on my own pages, because she often gives me first pick of the litter. It’s only fair—we’re family! 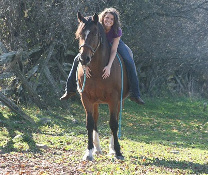 I live on a 100-acre farm in Beaverton, Ontario with Gypsy Vanner horses, Bernese Mountain Dogs and a few Havanese dogs as well. Although I always loved animals, I never expected to become a dog breeder. Instead, I trained and worked as a Registered Nurse. After retirement, I was able to devote more time to caring for animals. 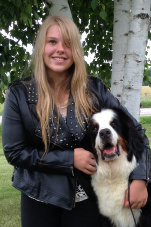 My daughter, Sherry Rupke, introduced me to the Bernese when she brought home her first, Mocca, at age 16. It was love at first sight. Mocca was a beautiful dog, with amazing markings, and an incredible personality. I liked the fact that as a mountain dog, she was large and had a thick coat, so she would be comfortable in an outdoor shelter year round. I could not have a dog inside because dirt and hair triggered my asthma. Mocca was an affectionate, loyal, protective dog. She only barked to alert me, and she never wandered. Her puppies were so beautiful, that when Sherry suggested we form a partnership to breed Bernese, I agreed. We purchased our first male, Riley, from British Columbia. He was very big and handsome and produced gorgeous puppies. Then we purchased two more girls, Lily and Kiss. Thus began our partnership in the Bernese world. When Sherry was in college, I cared for the dogs. She took the lead on whelping and promoting the breed. Meanwhile, she shared the skills and knowledge she was gaining while volunteering at our local vet clinic, and from her studies as a veterinary technologist. She introduced me to the importance of breeding correctly. I learned how to find good, strong healthy dogs, with sound pedigrees and generations of health clearances. As for the hands-on care, well, I had a strong foundation in human care-giving both as a registered nurse and as a mom. Providing quality care for pregnant dogs and newborn pups came naturally. Eventually, Sherry decided to focus all her energy on Goldendoodles, and left the Bernese business to me. We had imported Daiko and Dyne from Europe, and they’d added so much to our program. 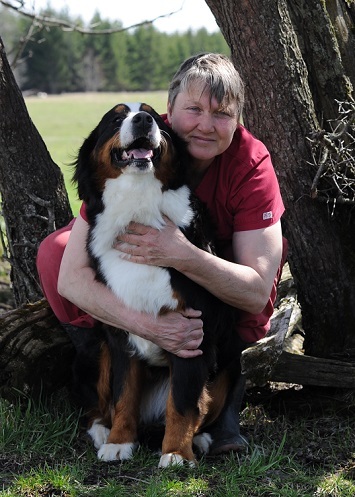 I decided to purchase more Bernese from Europe, both because North American breeders tended to be negative about Sherry’s hybrid program, and because many breeders here weren’t completing health clearances. I wanted to provide the healthiest dogs for my clients. I must admit, it is not easy being a breeder. My entire day is devoted to dogs and puppies. But it is very satisfying work and I take pride in the breeding program I developed with care. I liked the fact that the Bernese is a stocky farm dog, as well as a companion dog, and am attracted to old-style Bernese — solid and well-built. I wanted to see more of that in the dogs I produce. So, using the skills Sherry taught me, I found healthy, gorgeous dogs from European breeders to help me achieve my vision. I am very happy with my Bernese and thankful that Sherry entrusted me with improving the breed. I also love the fact that I am sharing this adventure with my daughter. Although we have branched out in different directions, we share the excitement and challenges of developing our lines. I enjoy her success, both as her mother and as a colleague. 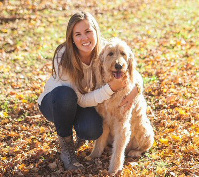 We both like working with clients and helping to match them with the perfect dog for their lifestyle. I think we’d both agree that the most fulfilling aspect of this job is seeing the dogs we breed serving a therapeutic role for people. Lucas, the resident SwissRidge dog behavior expert, is a truly gifted trainer and I am constantly learning from him. Dogs are my passion. I have loved being around them ever since I was a child. My mom says I was constantly bringing stray cats and dogs into our house in Poland, and Sherry says I’d fill the house with rescues now, if there was room for them. It’s true! I can’t stand seeing a homeless, unloved or abandoned animal. My greatest joy in life is rehabilitating dogs that others have given up on, and finding new homes for them. I started formally training dogs at age 18, working with security companies. I went on a journey learning from whom I considered the best trainers in the world . My goal was to create a training program that was efficient for the distractions ,and busy environments the pet dog faces on a daily basis.I began to create a personal teaching style tailored for everyday people and their pet dogs. I get so much satisfaction in rehabilitating dogs like Pit Bulls and mastiffs because when they do get out of hand, they can be very dangerous. Yet the results of training are transformative. It literally saves lives; people may tolerate a nippy Shih Tsu, but they won’t keep a volatile Pit Bull in the house for long. Now, as trainer at SwissRidge Kennels, I have had hands-on experience with many Bernedoodles. As I noted in “Bernedoodles: A Head to Tail Guide,” these are not difficult dogs to train. They tend to be very bright, might be a bit stubborn, and are usually sensitive. The SwissRidge training program has evolved in recent years, and will be expanding considerably in the year ahead. I look forward to being able to help more dogs—and their families—in the new facility. In the meantime, you can learn more about current services under training. Like Sherry, my work is also my hobby. But I do find time most days for my other passion, singing and song-writing. I also keep fit by practicing Brazilian jujitsu, hiking, biking, running and body building. When Sherry and I escape from the kennel, I enjoy traveling and immersing myself in different cultures. I am very lucky to have gathered some great staff and true animal lovers at SwissRidge Kennels. There is no way I could produce so many happy, healthy, well-socialized pups without the support of many capable people. I know that my dogs and my business are in good hands. Please meet them, through their own words, below. I provide administrative support at SwissRidge Kennels, and often I might be your first point of contact. My job includes answering phone calls and e-mails, booking flights, organizing all paperwork, booking appointments and making sure all clients’ needs are covered from the day they contact us until they get their pup and afterwards. I’ve held other customer service/receptionist jobs in the past, but none has been as fulfilling as this one. The best part of my job is interacting with future and existing members of our SwissRidge family. I love helping families find their newest furry friend. Working for a committed professional like Sherry, and being around cute pups and beautiful dogs top off my list of why I enjoy my job. I have had dogs most of my life, and there’s nothing like the love and companionship of man’s best friend. 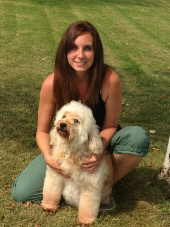 I have been working as the Operations Manager at SwissRidge Kennels since 2012. My duties cover a broad spectrum. I manage all employees and make sure operations are running smoothly, feed dogs, clean out pens, whelp puppies, bottle feed and socialize puppies, and anything else that comes up in a typical kennel day. We work hard as a team here to provide quality care for our four-legged friends. We are all hands-on with all the dogs and pups to promote healthy, happy creatures. I love my job—it’s a howl. No really, I love my job. I get to spend time with goofy fur-balls that give sloppy kisses and make me laugh at their carefree playful adventures. I have been an animal lover for as long as I can remember. If there was a sick or hurt animal I would bring it home. I’m sure my mother was afraid whenever I went out, because she was never sure what I’d come home with. I have three dogs of my own at home, but I’m happy to be surrounded by them all day long, too. I worked for SwissRidge as kennel attendant for about eight months in 2010-11. When I returned to the same position in September of 2013, I was so happy that that the dogs recognized me and were thrilled to see me again. What a greeting! Before being employed at SwissRidge, I worked at vet clinics, horse stables, and a laboratory. The thing that attracts me to this job, obviously, is my love for dogs. I love playing with the adults and helping the moms when they whelp. Plus, I love seeing the puppies making their new families so happy. The staff at SwissRidge are pretty amazing people. We all work incredibly hard to take care of the dogs. At home, I own four horses, two cats, and three dogs. Two of my dogs are rescues and the third is “Poptart,” who is a poodle from Sherry’s Paris and Valentino litter. Poptart is quite a character. She actually tries to sneak into the shower with me. When not at work, you can usually find me on hikes with the dogs, taking photos, or riding my horses to get them ready for the upcoming show season. 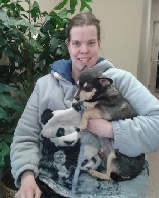 I am a Queen’s University student working at SwissRidge Kennels. Every day I come to work excited about getting to know each and every dog. I enjoy witnessing the puppies changing and growing and seeing their personalities develop. I could not pick a favourite dog at the kennel as I adore them all. I have a variety of responsibilities, including cleaning out pens, exercising and feeding all of the dogs and puppies. I love working at SwissRidge Kennels with Sherry and all of the staff and am so glad to have the opportunity to work doing something I am so passionate about. My family and I have a loveable SwissRidge Goldendoodle named Tucker who joined us nine years ago! I am a high school student with a goal of becoming a veterinary technician. At SwissRidge Kennels, I am one of the team members responsible for taking care of the dogs and making sure that they get what they need such as food, water, clean pens, exercise, and lots and lots of socializing! I really enjoy working here because every day there are new experiences. You never know what to expect. 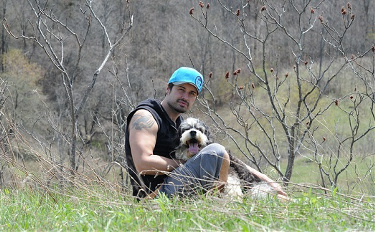 I love working with all of the dogs and knowing that they are relying on us to take good care of them. There is definitely never a dull moment. In my downtime, I keep myself busy with boxing. I also have two dogs of my own. I do a little bit of everything at SwissRidge, but my favourite duty is definitely bottle-feeding the puppies. My favourite story is of the tiny Goldendoodle that was the runt of the litter and not doing well. We all took turns bottle-feeding him, and happily, he’s doing great. Animals are my main interest in life and my goal is to always provide them with the best of care. Working at the kennel allows me to get to know their different personalities. My previous work experience was retail and child care; childcare isn’t so different than taking care of dogs! At home, I have two dogs named Gunsmoke and Pickle. Yes, that Pickle! I adopted Sherry’s famous Miniature Poodle stud when he retired from breeding. Coincidentally, my cat is named Pickles, which makes for some confusing but funny moments. I work with an awesome team at SwissRidge Kennels. My job is to groom all the pups before they go to their forever homes, and groom the other dogs that live here, so that they are always looking their best. I have been self-employed as a pet groomer since 2003 and take pride in my professionalism and work ethic. I love working at SwissRidge because we work as a team and help each other when we can. I also love cuddling the dogs after they’ve been groomed. At SwissRidge, I’m the Jim-of-all-trades, repairing things, doing the gardening, and shuttling pups to the airport. I previously worked in the automotive industry. What I love about the kennel, not surprisingly, is the dogs. On the surface, some look the same, but they are like snowflakes: each one is different. It is lots of fun to be able to spend time with the pups. 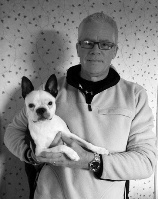 At home, there is Rosey, our Boston Terrier. She’s a rescue dog. One of her legs doesn’t work, but she doesn’t know it! My goal in life is to be at least half the man Rosey my dog thinks I am.